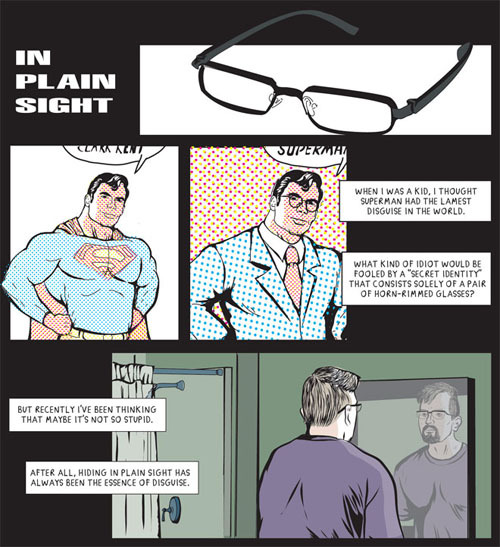 My comic “In Plain Sight” is part of the first issue of Print-on-Demand anthology Queerbait. The focus is on GLBT cartoonists, mostly doing superhero or genre inspired material. Though my piece is actually autobiographical, it fits in due to the subject matter, which is about secret identities. It’s a revised version of one of my first comic strips — I did the first version 6 years ago. The first one and a half pages are written almost identically to the original, but it is now two pages longer and completely redrawn. This actually came out at the end of last year, but I was away at the time and never got around to posting it. Also still haven’t seen a copy of the book in question, but Tony Smith said that he’d be mailing me one this week. See below for the first few panels of the story. You can purchase the book through Indy Planet , or as a digital downloand through the Heroscribe website. Steve, this looks amazing. I always wanted to see someone play with secret identities as a metaphor for sexuality.